The ruling Progressive Party of Maldives (PPM) has conditioned the development of five islands in the Meemu Atoll Dhiggaru constituency on a by-election win for the party on June 6. Speaking at a rally on Tuesday night, PPM MP and parliamentary group leader Ahmed Nihan promised to include funds in the 2016 state budget for Dhiggaru constituency development if the PPM candidate Faris Maumoon is elected with more than 70 percent of the vote. “God willing, if you elect Faris with over 70 percent of the votes we will include the extra money needed to develop projects of Dhihgaru constituency,” the Vilimalé MP said. Faris is the son of PPM leader and former president Maumoon Abdul Gayoom and the nephew of president Abdulla Yameen. 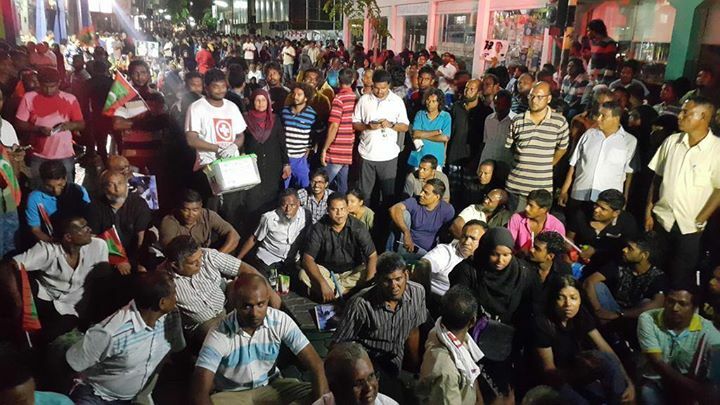 The by-election was triggered by the jailing of former MP Ahmed Nazim, also a PPM member. He was convicted of defrauding the former atolls ministry and imprisoned for life. The Dhiggaru constituency is a PPM stronghold. Nihan said the people of Maduvvari, Dhiggaru, Muli, Veyvah and Raimandhoo are casting votes for their future development. “On June 6 the people of Dhiggaru constituency is not deciding the future of PPM. They are not deciding to give a parliament seat to Faris. The people of Dhihgaru constituency are deciding the development of their constituency. Some 2,555 people are eligible to vote in the by-election. However, Nihan also said the government will not discriminate against constituencies which elected members of the main opposition Maldivian Democratic Party (MDP). “We cannot discriminate against a certain group of people just because they have members of the MDP. The president wants development for all areas of Maldives without discrimination,” he said. The PPM also announced MP Abdul Raheem Abdulla will gift air conditioning systems for the Dhiggaru mosques. “Abduhraheem told me he had decided to gift eight air-condition system to the mosque by Ramadan. By coincidence this falls in to the period of Faris’s campaigning. But that’s totally different,” Nihan said. Ruling coalition partner the Maldives Development Alliance has also decided to gift eight air conditioning systems to Madduvari Island, he announced. The by-election is expected to be hotly contested amid heightened political tension following the jailing of former president Mohamed Nasheed and ex-defence minister Mohamed Nazim as well as the alleged unfair targeting of JP leader Gasim Ibrahim’s business interests. The ruling party was previously also accused of vote-buying after a high-profile handout of air-conditioners to a school in Raa Atoll Alifushi, shortly before an island council by-election. The PPM and MDA hold a majority of the 85 member house with 48 MPs. The MDP now has 21 MPs and the opposition Jumhooree Party has 10 seats. Addu City councillor for the Hulhumeedhoo district, Ali Mohamed, has defected from the opposition Maldivian Democratic Party (MDP) to the ruling Progressive Party of Maldives (PPM). Ali Mohamed signed his membership form at a ceremony held on Tuesday night to inaugurate a resort development project on the uninhabited island of Ismehela in the southernmost atoll. He said at the ceremony that he wanted to work with the government to ensure the development of Addu City. “We were elected by the people to serve them. I don’t believe that I was elected to topple governments and to protest against the government on the street,” he was quoted as saying by local media. He said development can be ensured by working with the government and called on other MDP MPs councillors to sign for the ruling party. A futsal stadium recently built in Hulhumeedhoo and the 600-bed integrated resort development project on Ismelehera was proof that results can be achieved through cooperation, he added. The MDP had won all six seats of the Addu City council in both the 2011 and 2013 local council elections. Ali Mohamed becomes the first PPM councillor for Addu City. Meanwhile, Addu City mayor Abdulla Sodiq said in a Facebook post on Tuesday that the council has never obstructed the government’s development projects. Progress or development cannot be achieved by “selling political convictions for a small sum of money,” he wrote. The ruling coalition’s campaign for the upcoming parliamentary by-election for the Dhiggaru constituency is underway while the opposition alliance is yet to decide on fielding a single candidate. A primary of the Progressive Party of Maldives (PPM) among four candidates seeking the ruling party’s ticket is due to take place on Friday. 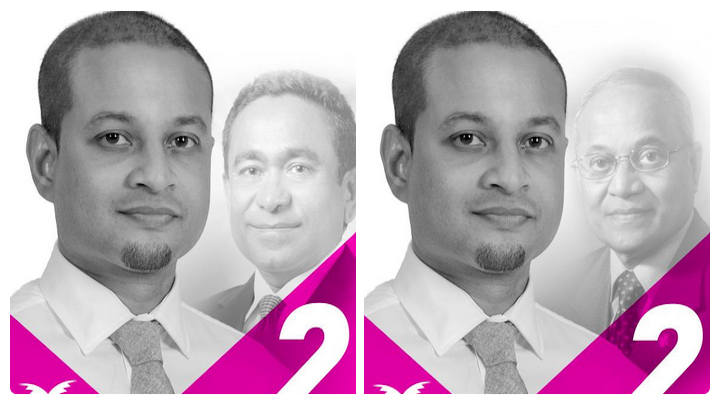 Former president Maumoon Abdul Gayoom’s eldest son, Ahmed Faris Maumoon, is among the contenders. The by-election, triggered by the 25-year jail sentence handed down to former ruling party MP Ahmed Nazim, is scheduled to take place on June 6. All candidates must inform the Elections Commission of their intent to contest the by-elections by the end of April. The by-election is expected to be hotly contested amid heightened political tension following the jailing of former president Mohamed Nasheed and ex-defence minister Mohamed Nazim as well as the alleged unfair targeting of Jumhooree Party Leader Gasim Ibrahim’s business interests. Faris is meanwhile in Dhiggaru on a campaign trip at present. Other contenders in the PPM primary include Meemu atoll council president Moosa Naseer, deputy environment minister Mohamed Hanim and Dhiggaru island council president Imran Ismail. The ‘Maldivians against brutality’ alliance, made up of the main opposition Maldivian Democratic Party (MDP), Adhaalath Party (AP) and senior members of the Jumhooree Party (JP), announced last week that discussions were underway on fielding a single candidate. AP spokesperson Ali Zahir has since announced his intention of contesting in the by-election. Meanwhile, former MDP chairperson MP Moosa Manik has criticised his old party for not holding a primary to select a candidate. MDP Vice President Mohamed Shifaz told Minivan News today that the party has not yet decided whether to field a candidate. But the MDP “will definitely hold primaries” if it chooses to contest the by-election. “As a party we have to consider many factors including the independence of the independent institution and so on. The MDP has not yet decided to compete for the seat but if we do a candidate would be selected through primaries,” he said. MP Moosa Manik, who was expelled from the MDP last year after repeatedly voting against the party’s whip-line, said the party must hold a primary if it is to respect its rules and founding principles. “In the local council elections I decided not to hold primaries but the decision was opposed by a lot of members. So in the end we had to hold primaries,” he said. In last year’s parliamentary polls, Nazim was elected with 60 percent of the vote from the Dhiggaru constituency after competing against an MDP candidate. The PPM also won a majority of the Meemu atoll council, which has four PPM members, one MDP member and one independent member. Former President, and leader of the ruling Progressive Party of Maldives (PPM), Maumoon Abdul Gayoom has described the opposition’s alliance to defend the Constitution as a “waste of time”. Gayoom told reporters that the current government has in no way violated the Constitution and that there is no reason for any party to talk about defending it. “Therefore, when some people have come out claiming to defend the Constitution, it makes me laugh,” Gayoom told reporters before travelling to the Delhi Sustainable Development Summit (DSDS) this morning. The former 30-year ruler, who will participate in the summit as a panelist and a speaker, also questioned the intentions of the opposition, stating that “our President Abdulla Yameen pays special attention to follow the Constitution”. Gayoom’s comments are the first from a high level member of the ruling party since the Maldivian Democratic Party (MDP) and Jumhooree Party’s (JP) decision to work together in defending the Constitution. The parties are alleging that the government is narrowing civil liberties, intimidating political opponents, and destroying state’s checks and balances. PPM spokesman MP Ali Arif told Minivan News that the opposition parties were unable to specify which part of the Constitution the government has violated. “We have asked them which specific part or article of the Constitution the government has violated. They cannot seem to answer the question. This is just noise, all these claims are baseless,” stated Arif. He also said that amendments to the Judicature Act – which saw the removal of two Supreme Court judges, and amendments to the Auditor General’s Act – which saw the reappointment of the auditor general, were all legislative changes brought by parliament. Former Auditor General Niyaz Ibrahim has suggested his removal – just days after an audit report implicated the tourism minister in a US$6 million corruption scandal – was not legal without changes to the Constitution. The Civil Court has, meanwhile, said the People’s Majlis had “forced” the Judicial Services Commission to deem Chief Justice Ahmed Faiz and Justice Muthasim Adnan unfit for the Supreme Court bench without due process, through an “unconstitutional” amendment to the Judicature Act. Meanwhile, the MDP and the JP held a third round of discussions at Maafannu Kunooz on Sunday (January 1) night, agreeing to officially sign a document concerning their joint efforts to defend the Constitution. The document, scheduled to be signed at a special ceremony on Thursday (January 5), will be followed by a joint rally that evening at the Carnival area in Malé. Although the Adhaalath Party has decided against joining the alliance, the Maldives Trade Union has joined the opposition, claiming that the government’s persistent violations of the constitution have “eroded crucial checks and balances and accountability mechanisms”. The MTU was inaugurated in May 2014, with 180 members aiming to provide an independent voice for the protection of small and medium sized businesses. Zahir formed the group after clashing with authorities over the new tax regime – introduced by the MDP government. He was investigated the the Prosecutor General’s Office last year for tax evasion. Transparency Maldives (TM) has called upon the state and political parties to operate within the Constitution, and to respect democratic norms and principles. “Transparency Maldives notes with grave concern the increasing trend of undermining democratic practices and institutions by the State,” read a statement from the NGO today. TM cited the attempts to reduce the number of judges in the Supreme Court, the sudden removal of the auditor general by the parliament, and the resolution of the opposition Maldivian Democratic Party (MDP) calling for the presidency to be handed over to Jumhooree Party (JP) leader Gasim Ibrahim. The MDP, private lawyers, and civil society groups have also heavily criticised the – now successful – attempts to remove Chief Justice Ahmed Faiz and Justice Muthasim Adnan from the Supreme Court. In a statement released prior to the Majlis decision to remove the pair, TM argued that their removal would further undermine the independence of the judiciary. “The impartiality and independence of the Supreme Court is not solely decided by the number of Supreme Court Justices but rather by the upholding of judicial integrity and principles,” argued the anti-corruption NGO. TM said the decision to dismiss the pair without publicising the criteria used to deem them guilty of gross misconduct or gross incompetence – as required in Article 154 of the Constitution – raised questions about the fairness of the process. “The criteria used must be objective, based on merit, transparent and well-publicised so that any public concerns about the process may be addressed. The NGO suggested that amendments to the Judicature Act also denied the judges in question the right to defend themselves prior to their dismissal – a point also made today by the Maldivian Democracy Network. Similarly, Auditor General Niyaz Ibrahim was removed from his post in October after pro-government MPs introduced amendments to the Audit Act. “TM notes that the recent amendment to the Audit Act which abruptly ended the tenure of the sitting Auditor General, before the Constitutionally mandated seven-year term serves to undermine the independence of the Auditor General’s Office,” said today’s statement. The press release further noted that the removal of the auditor general is only constitutionally allowed for proven misconduct, incapacity, or incompetence. Niyaz’s removal was justified on the grounds that the Audit Act predated the 2008 Constitution and thereby did not include the current responsibilities, powers, mandate, qualifications, and ethical standards required for the post holder. 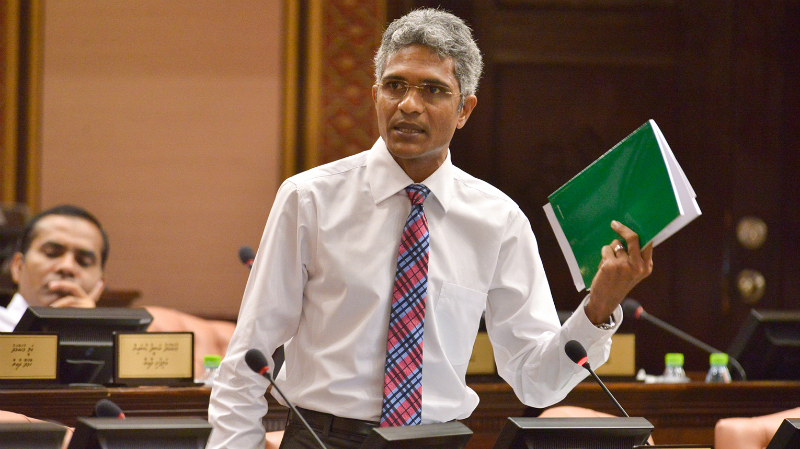 Niyaz chose not to stand again for the post, requesting the High Court to place an injunction against the new amendment – though his replacement was sworn in on November 24, within on hour of his approval by the Majlis. The same day the Majlis authorised Niyaz’ removal, Niyaz had signed an audit report which implicated Minister of Tourism Ahmed Adeeb in a US$6million corruption scandal. Adeeb – also Progressive Party of Maldives deputy leader – was quick to dismiss the report as politically motivated, while the government appears to have taken no further action in the case – despite pre-election pledges to root out corruption. Finally, TM denounced the MDP’s resolution which called on President Abdulla Yameen to hand power to JP leader Gasim Ibrahim. The MDP leadership suggested that growing gang violence – which has resulted in four murders in the capital this year – coupled with the water crisis meant the president should step down. “The president is not fulfilling presidential duties and ruling in absentia. So it is better for him to handover governance to Gasim Ibrahim,” said former President Nasheed during the meeting. The PPM responded to the resolution last week by accusing the MDP of attempting to disturb peace and unity during the water shortage. The PPM also characterised the national council decision as an “undemocratic and uncivilised” attempt to topple a legitimately elected government. The Progressive Party of Maldives will rebuild a devastated nation through job opportunities for the youth and a crackdown on violent crime, said President Abdulla Yameen while celebrating one year in office. Yameen urged young people to take advantage of the opportunities that would be created by growing tourism and large scale foreign-funded infrastructure projects, while pledging to bring peace and security to the nation. “I want to say tonight as well in your presence, this government will have no mercy at all for those who slaughter Maldivian citizens with no mercy,” said Yameen at the ‘Successful 365 Days’ event held in Male’ this evening. He pledged to implement the death penalty – reintroduced under his government, for the sake of human rights and dignity. “Saving the Maldives from these big atrocities is the biggest aim of this government,” he said, stating that Maldivians by nature sought peace and stability. Yameen said that proposed changes to legislation would remove violent crime which has blighted the country in recent months, suggesting the framers of the 2008 constitution wanted to create unrest and anarchy. An estimated 3000 people attended the event at the carnival ground area to hear cabinet members and party colleagues detail the achievements of President Yameen’s anniversary. While Islamic Minister Dr Mohamed Shaheem Ali Saeed said Yameen had united the nation, Speaker of the People’s Majlis Abdulla Maseeh Mohamed launched a book detailing the administration’s accomplishments. Speaking earlier in the evening President’s Office Undersecretary Dr Hussain Faiz listed the achievements of the cabinet’s social council, which he said included a doctor for each island, opening 46 pharmacies, and introducing sea ambulance services in six atolls. Faiz also noted that the government had introduced the unlimited Aasandha healthcare scheme for persons with chronic illnesses, as well as raising the old age pension to MVR5000. Pledges to provide unlimited healthcare to all citizens as well as a doctor for every family were two of the administration’s aims for an ambitious 100 day programme twelve months ago, while nationwide sea ambulances had been promised within the first year. Faiz also noted the feasibility studies carried out into an Islamic University in the Maldives, while saying that the role of Islam and Quran had been expanded in the new national curriculum. Discussing the government’s record on development and the economy, Minister of Fisheries and Agriculture Dr Mohamed Shainee noted that the country’s dollar shortage had been alleviated, while MVR68 million worth of loans were issued. Shainee claimed that, in addition to 1,700 new businesses being registered, and new resorts being put up for bidding, 19 foreign investors had registered a commitment of investing over US$600 million. The government has introduced legislation for special economic zones – with a minimum investment of US$150 million – in an attempt to draw in new developers, though the only significant agreement signed as yet has been the Chinese deal to begin redevelopment of Ibrahim Nasir International Airport. The fisheries minister suggested that President Yameen’s background as an economist had contributed to the administration achieving the equivalent of six year’s work in one. The ruling Progressive Party of the Maldives (PPM) has dismissed rumors that President Maumoon Abdul Gayoom may leave the party as “baseless and false”. “We assure our beloved members [Gayoom] will not leave this party and join another party or take on any position in another party,” said a statement released on Tuesday (November 18). The former president of 30 years was elected as PPM president at the party’s 2012 congress, a year after his acrimonious split from the Dhivehi Rayyithunge Party (DRP). The statement came in response to rumors Gayoom may rejoin the DRP, local media have said. Speculation of tension between Gayoom and his half brother President Abdulla Yameen has grown since the PPM parliamentary group’s decision to reject Gayoom’s choice for the post of Prosecutor General, his nephew Maumoon Hameed. However, the two have presented a united front with joint-appearances at party functions on PPM’s third anniversary in power. Gayoom on November 13 congratulated Yameen for allegedly fulfilling majority of pledges in the PPM manifesto and said Maldivians had found new life in Yameen’s presidency. Gayoom had founded the DRP in 2005 and ran on the party ticket for the 2008 multiparty presidential election. When he lost, Gayoom retired from politics and handed over the party reigns to him former running mate Ahmed Thasmeen Ali. He was then given the title of Zaeem or Honorary leader. However in April 2011, Gayoom established the Zaeem DRP or Z-DRP as a separate branch of DRP amidst growing tension between himself and Thasmeen. He went on to establish the PPM in September 2011. Thasmeen defected to the opposition Maldivian Democratic Party (MDP) during the presidential elections of September 2013 after he and former President Dr Mohamed Waheed gained only five percent of the popular vote. MP ‘Colonel’ Mohamed Nasheed – who had defected to the DRP from the MDP – ahead of the presidential vote took over DRP and announced a rebrand effort. He has said the next DRP congress will see a resolution to award Gayoom the title of Zaeem again. Nasheed has previously described the party as now being in the ‘ICU’, accusing the party’s former leadership of leaving behind MVR10million in debt (US$ 64,5161) and abandoning the party with its data and assets.